Stone Axes in order of increasing durability: Sedimentary, Metamorphic, Igneous Intrusive, Igneous Extrusive. Stone axes can be crafted with either a stick or a bone as the handle. Knapping out the Axe Head. Metal Axes can only be made from tool metals. They can be cast in ceramic molds, or worked on a metal anvil. Bismuth Bronze, Black Bronze, Bronze, and Copper Axes can be cast using a Vessel or a Ceramic Mold instead of working on an anvil. Place an empty or partially filled Axe mold into the slot to fill it with metal from the vessel. It takes 100 units of metal to completely fill an empty Ceramic Mold. The text in the vessel's GUI will be updated to show the amount of metal remaining in the vessel. Put the ceramic Axe mold in the second input slot and wait for the filled mold to finished. 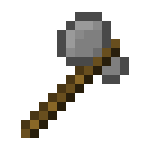 Axe Heads can also be crafted by using ingots on an anvil with a hammer. This is the only option for higher tier metals that cannot be cast. The durability depends both on the metal used and the skill of the smith forging the tool. Axes are used to chop down trees, and acquire fruit tree saplings. Stone axes are much slower than their metal counterparts, and are less efficient in their yield of logs when chopping down a tree, with stone axes only having about a 90% chance of dropping a log item for each log block. While the axe is not technically a weapon, it can be used to deal slashing damage at the cost of using twice the durability per hit. If true then the vanilla Minecraft recipes for creating wooden axes are enabled. In addition, a recipe is added for converting TFCraft stone axes to the vanilla version. Supports require an axe to be crafted. Stone axes can be crafted with a bone instead of a stick. Added fruit trees which require an axe to harvest saplings. Axes give 4 planks from a single log. Axes give 3 planks from a single log. Removed crafting of supports using an axe. Using a stone axe to chop trees results in a 10% chance for a block to not yield a log. Attempting to chop down a tree with an axe that doesn’t have enough durability left for each and every block in the tree will cause only part of the tree to be chopped down. Removed crafting of planks using an axe. This page was last modified on 9 July 2015, at 18:13.